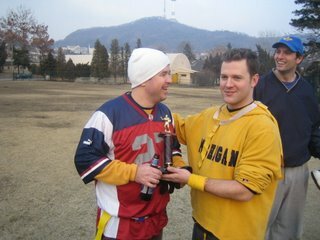 Well sports fan after hearing about the Seoul Bowl for the past two weeks the big day finally came. The Gecko's Glaciers met the RMT Chiefs at Yongsan's South Post for what was to be history in the making. With the 1st 2-4 of Samuel Adams provided by Chief/Glacier Clay the game got underway. From the start the Chiefs played the game simple. Throw the ball and catch it. Keeping with our motto of course. We dominated the Glaciers from the kickoff with our very own Marc "Speedy Gonazalez" rushing Clark every chance he had. I'm sure Clark was very much annoyed as he was sacked quite a few times over the period of 2 hours. Gecko's threw everything they had against the Chiefs offense and defensive lines but we held strong due to some good interceptions, passes and kicks. John Morris (pictured above with a beer in his hand) kept the team motivated while Tall Paul (pictured behind Clark) made some of the best catches i've seen in a while. We even invented a play after him called the Statue of Paul. We can credit this play to Frasier. In the dying minutes of the game, all of the offensive line rushed into the end zone and made a circle around Paul to block out any defensive move to hit the ball away from him. It worked with great sucess. All the Glacier's shook their heads in amazement at is natural athletic ability!! ha ha.. Not that it took much, throw the ball at Paul's head and it's higher than any one person could jump!. All and all the game was clean and a lot of fun. No sore losers which is how any game should be played. Mongolian food and beers were shared after the game (as was another case of Samuel Adam's at halftime) at the Navy Club on base. Many thanks to Clark and Clay without whom the game wouldn't have taken place. For those who want to see the trophy it's currently being displayed at the RMT. And our modest writer forgot about one of the turning points. Early in the game a Gecko kick-off return came all the way back as Big D had grabbed the flag and no one else knew. Great play saving tackle Big D!!! congrats on the win boyz. I'm not one to blow my own horn haha. You also played a part in that John, if you hadn't dived for him making him jump I wouldn't have been able to grab his flag..